Meet Dan Quibell, the man behind The Bacon Experiment, a 30-day bacon fast (or feast…?). For 30 days straight, Dan consumed nothing but bacon, and the results will shock you! The Bacon Experiment came into my radar through a Facebook group focused on the ketogenic lifestyle. This was all around the time I had just got back on the keto wagon; the timing really couldn’t have been more perfect. While I found the experiment to be a bit extreme, I was intrigued and inspired by the determination displayed and the results achieved. I felt a genuine sense of camaraderie among the folks in his group. It’s a community of like-minded low carb folks that encourage and motivate each other. If you’ve got a Facebook, you’ve got to go check it out! And for those interested in conducting your own bacon experiment, you can download this free PDF walk-through and guidelines to ensure you are on the right track. Recently, I reached out to Dan for an interview to pick his brain about The Bacon Experiment and ketogenic living. He graciously agreed! Thank you so much for taking the time to answer my questions, Dan. Walk me through The Bacon Experiment step-by-step. What were your goals and expectations going into this? Dan: The Bacon Experiment was me eating nothing but bacon for an entire month. Two pounds of bacon, or roughly 30 pieces, every day. The goal here was to get people’s attention using BACON, then try to teach them something about low carb and ketogenic diets and all the benefits that come with it. Cutting out carbs has been life-changing for me, and I wanted others to benefit as well. I expected that even though I was eating 2500 calories a day, an increase of 500 calories a day for me, that I would not gain much weight, I already knew that eating fat and protein doesn’t make you fat. Dan: Short Answer: because BACON IS AWESOME! The long answer: bacon has a great fat to protein ratio, and if there were one food I could eat for a month it would be bacon. It also already has the salt/sodium that low carbers need built right into it. The more I researched it, the better it looked; pork has a better amino acid profile than beef even. Bacon also seems like the perfect food to get people interested in this “diet”… how many other diets allow you to eat bacon? Dan: The biggest and most unexpected change was losing so much body fat in the 30 days. I lost 19.6 pounds by the end of the month and ate 60 pounds of bacon during that same time! Crazy right? My energy was good the entire time and my doctor was quite impressed with my blood work. I had a complete blood panel done before and after this experiment. My blood pressure dropped 30 points, my cholesterol numbers looked good, and my liver markers were perfect. My Dr. told me, “Keep doing whatever it is that you’re doing because it’s working!” I still eat bacon most days for breakfast. After seeing your results, have others joined in on The Bacon Experiment? Dan: The Bacon Experiment Facebook group has over 2500 members currently and has been slowly growing. Quite a few have tried their own version of the bacon experiment for one week, and most have seen between a 4 to 11-pound weight loss in just one week. Some transition to a ketogenic or even zero carb diet after trying it out for a week. 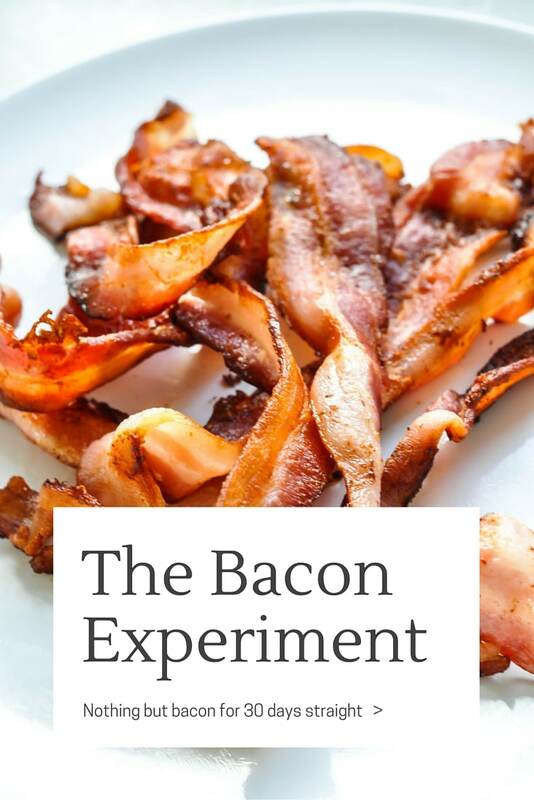 Want to conduct your own bacon experiment? Get Dan's free guide to get started! What was your diet like before The Bacon Experiment? Dan: I have tried just about everything over the years including low fat, low calorie, vegetarianism, veganism, raw foods, and even fruitarianism. Yes, I was the guy buying a case of bananas and bag of organic apples each week for a while. Most of these things made it, so I lost some “weight, ” but unfortunately I also lost muscle and would then regain the weight plus extra. For the year leading up to the bacon experiment, I had discovered something new, something sustainable and a way to GAIN muscle and LOSE fat! You guessed it, a Low Carb High Fat Ketogenic Lifestyle. Getting enough protein and the remainder of my energy requirements from fat (all from real food sources like organic grass-fed butter, free-range eggs, wild caught salmon and grass-fed beef) proved to be life-changing for me. After a year I was ready to tell other people about it and show them how to do it as well. The Bacon Experiment was born. Do you track your macros? What do they look like for a day? Dan: The only macro I track/tracked before and after the experiment is protein really. I no longer track carbs because I am not really eating many veggies these days other than toppings for my bun-less burgers. I make sure I get between 120-150 grams of protein a day. My carbs are probably between 8-15 grams a day since 90% of my diet consists of meat and eggs. During the bacon experiment, my macros were the same each day since I ate exactly 1 pound of normal strip bacon each day and 1 pound of back bacon each day. This worked out to 244 grams of protein and 164 grams of fat roughly after being cooked. That is roughly 2500 calories. Do you still eat bacon or are you sick of it? Dan: I ate bacon for breakfast today. I don’t think it’s possible for me to get sick of bacon. After 30 days of bacon, I imagine you’re a bit of a bacon connoisseur. Can you tell us what your favorite cuts of bacon are? Do you have a specific brand you can recommend? Dan: When I ate only bacon for 30 days, I made sure it was the highest quality stuff I could find. It was pasture raised, antibiotic free, non-GMO and steroid free. It was also $11 – $12 per pound. Instead of having to get a loan to buy bacon, I now try to get thick cut bacon of whatever brand is on sale. I’m in Canada, so not sure if it’s available everywhere, but Presidents Choice Thick cut has been my favorite find so far. It tastes as good as the expensive farm bacon that I ate during the experiment. How about the method of preparation? How do you prep your bacon to get the perfect cook? Dan: Depends on the thickness to determine cooking times, but oven cooked on a cookie sheet is a really good and reliable method. 400 degrees for about 18 mins. The best way is deep frying in bacon fat/grease. I had 2-3 cups of bacon fat at one point in my frying pan, and the grease was an inch thick. I made sure I had a lid to keep the splatter in and would deep fry the bacon for a few minutes on each side. It turned out AMAZINGLY PERFECT. Aside from bacon, what’s your favorite keto meal? Dan: For taste and satisfaction, I would say a triple bacon cheeseburger without a bun, of course. I would probably include some chipotle mayo that I would make myself. For health and longevity, I would say grilled, or fried wild caught salmon with a bit of apple cider vinegar, Himalayan salt, and organic turmeric to absorb as much of the omega 3’s and DHA possible. Did you find it difficult to eat one thing for 30 days straight? If so, how did you find the willpower to stay the course? Dan: The final week, I was REALLY craving steak. But it wasn’t really as hard as I thought it might be to get through the 30 days. I made some bone broth from grass fed beef bones to get me through the last week. Do you have any advice for those just starting a ketogenic diet? Dan: Become a student and continue to learn every single day. Join the ketogenic and low carb community. That doesn’t mean you have to spend all your time talking about it, but when you see other peoples results every day, I don’t see how anyone could not be motivated. The benefits to blood sugar control, the weight loss success stories, the health issues that disappear. The results clearly speak for themselves. Takeaway #1: Eating fat does not necessarily make you fat. In fact, a low carb, high-fat diet can be a great way to improve your body composition by simultaneously lowering body fat and maintaining muscle mass. Takeaway #2: A high fat, low carb diet can actually improve your health markers including blood pressure and cholesterol levels. Takeaway #3: Bacon is delicious. Duh. And don't forget to snag your free guide! 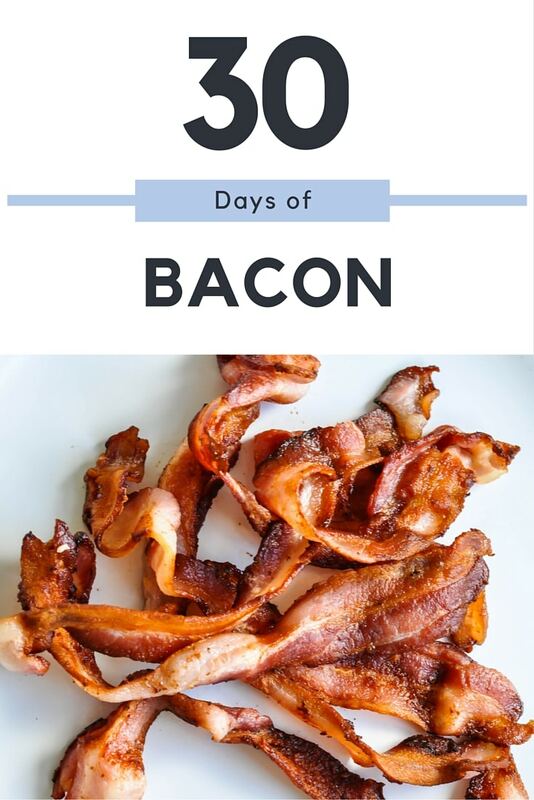 Do you think you could eat nothing but bacon for 30 days straight? Have you ever tried a zero carb diet? Let me know in the comments below! Actually, Kathleen, nitrates turn into nitrous oxide in your body and SHOULD be LOWERING your blood pressure. I mean, that’s the general effect of eating nitrates in VEGETABLES, which almost no one disputes we should be eating. And “sulphates”? Do you mean sulfites? Because I have never seen those in bacon. If you are just entertaining scenarios, don’t try to come off like it actually happened. If someone *is* reacting badly to bacon, maybe they just have a pork sensitivity. It happens. LOL @ “Nitrates turn into nitrous oxide in your body.” You’re dumb. She meant nitric oxide. Nitrates in food GRT metabolized into nitric oxide, which relaxes blood vessels and lowers blood pressure. It can also give you some nice hard boners. They also become horrible bad things when burned. If you aren’t overcooking your bacon, everything is great. PS: Salad has more nitrates than bacon. I am type 1 what and how do u think it would work for me. I was told that I can’t so a low carb diet even thought I think it would be good for me? Joy, search for “Diabetes Done Differently” on facebook. It’s run by my sister and brother-in-law about managing my niece’s T1D with a LCHF diet. Have you checked out Dr. Bernstein’s book – “Dr. Bernstein’s Diabetic Solution”? Definitely full of information. My wife was diagnosed at 45 with type 1 LADA (Latent Autoimmune Diabetes of Adulthood) diabetes. When her “diabetic nutritionist” told her she wasn’t getting enough carbs in her diet she listened and ended up with organ damaging high blood sugar numbers affecting her digestive systems, causing aches and pains and blurring her vision due to inflammation. She went on the Keto diet and normalized her blood sugars and delayed her need for insulin greatly. “pork has a better amino acid profile than beef even” – I’ve tried looking this up and I can’t find anything but I would like to. Can anyone help me? I ate meat/water only last year for six months, lost 50 pounds, had a full physical- and all my numbers were perfect. I am ketogenic now. <20 net grams carbohydrate a day and still losing. I have 30 to go. Amazing results! Thank you for sharing. I don’t know if I could do it… I love my veggies too much! I’ve been hearing from lots of people who aim for zero carbs and it seems to be working great for them. Zero carbs is something to avoid doing long term unless you really want colon cancer badly. We really need vegetables in our diet, dark leafy greens being especially important if nothing else, for the protective effects they have against the negative aspects of the meat and to promote healthy intestinal bacteria with fermentable fibers. No we don’t. Inuit did just fine without eating leaves. The Inuit also consumed a lot of things like kelp and algae, which also can count as leafy greens, other weeds, nuts, and tubers if further inland and even some of what was partially digested by their kills. Many people live quite well on zero carbs, simply because the cold weather prevents any plant life being readily available. I’m curious about your scientific evidence/peer reviewed articles you have to share to back up your statement that we need dark leafy greens to protect us against the “negative aspects of meat.” What are those “negative aspects” and what is your evidence that leafy greens protect us from them? Heme is the major one relating to colon cancer and there is observational evidence that chlorophyll, very plentiful in dark leafy greens, is protective against that. There is also evidence that the mutagens created by cooking meat can be protected against by indoles phytochemicals, which are most abundant in cruciferous vegetables. There is also the TMAO issue but that appears to relate to also consuming grains which is obviously not an issue for someone who is keto unless they are consuming the indigestible parts of the bran as a fiber supplement for some reason. go tell the Massai-people this, they lost their veggies for decades, never had cancer(do not have a word for it!!). In Keto, you still consume plenty of dark, leafy greens. Your fibrous carbohydrates don’t count toward your total carb grams per day since they are digested differently than less fibrous, more sugar-based (and we’re talking scientific sugar – glucose and such, not raw sugar) carbs. There are plenty of meals where I take 3 -4 cups of spinach leaves, drench them in a fatty dressing with some cheese, and chow down with some sous vide steak. It’s also vital to supplement electrolytes. Some vegies are good, Kale, spinach… especially cooked with bacon and cheese! Kathleen *did* ask about sulfites, not sulfates. And the nitrates in food turn into NITRIC oxide, not nitrous oxide. I have to ask.. how were the bowel movements on an all-bacon diet? No constipation? Erik, could you cite some evidence for your opinion about colon cancer if you don’t get your dark leafy veggies? I’ve seen reports from time to time of meat eating leading to colon cancer but when I followed up, the studies were poor. Maybe you’ve found some good studies. I’d like to know. The first study is easily dismissed. First, it’s based on a dietary questionnaire. Many people would dismiss the study just for that. Dietary questionnaires are notorious for subjective inaccuracy. And was it just one questionnaire per subject? So 9 years later you want to draw conclusions when the diet has been guessed at just once? GIGO. Further, the multi variate ratios: as the authors themselves note, the women’s ratios offered no correlation between heme and outcome so scratch that. For the men, the maximum is a mere 1.29 which, in the context of an epidemiological study is too small by more than an order of magnitude. You need a ratio of at least 3.5 to even think about drawing causal conclusions. Multivariate analysis has a great deal of subjectivity built in, aside from all the other variables in the study, so need extremely strong ratios before one can draw conclusions. I certainly would not entertain the slightest qualms about my diet on the basis of this study. The second study is over my competence level to analyze so I will have to wait until I find it analyzed, or a similar study analyzed, by someone competent. But I will provide a word of caution: The language of the study is in terms of the Somatic Mutation theory of cancer. Dr Thomas Seyfried’s experiments with transplanted nucleii have put paid to that theory pretty conclusively. I’m a moderately competent jock (~20 miles weekly running, ~4 miles weekly swimming, weights, etc.). How would a ketogenic/low carb diet affect my training? Check out prof Tim Noakes, he’s a marathon runner I think who is a convert from high carb to lchf. Tim Tebow eats keto and he is ripped! j/s! Were any kind of supplements taken during The Bacon Experiment? Been a bacon lover for years and have lost much weight quickly on low carbs, including bacon daily. I did try to cut out all sugars when diabetes 2 was diagnosed but I had to eat some carbs as I got very tired in my head. Also what about the nitrates and sulphites in bacon? These seem to make my blood pressure worse. It sounds like something I want to try for myself. I believe that the low carb high fat diet and lifestyle is the way to go. The lipid-cholesterol hypothesis of coronary disease put out by Dr. Ancel Keys has been debunked. I was starting medical school at the same time he made the cover of TIME. He never lectured to my class at the U of MN. Your self experiment is just further evidence which would be made more convincing if a crossover 30 day high carb low fat diet with weight and labs were done. That would really be interesting. Obviously eating nothing but bacon results in an extremely low carb , ketogenic diet. It should result in significant loss of excess weight, without weighing or counting. And if you re crazy enough it should be fine to try it for a month. I really want to try the LCHF diet. I am only concerned because I have chronic kidney disease. I have to monitor protein because of my kidneys and high uric acid. LCHF can be beneficial for many, but please consult and work with your doctor or renal dietician before embarking on a new dietary lifestyle to ensure it is a good fit for you. Best of luck to you! If anyone has any ketogenic/LCHF studies to share in relation to chronic kidney disease and/or renal failure (positive or negative! ), please link here in the comments to provide additional info. The fat to protein ration in bacon is very high on the fat end. 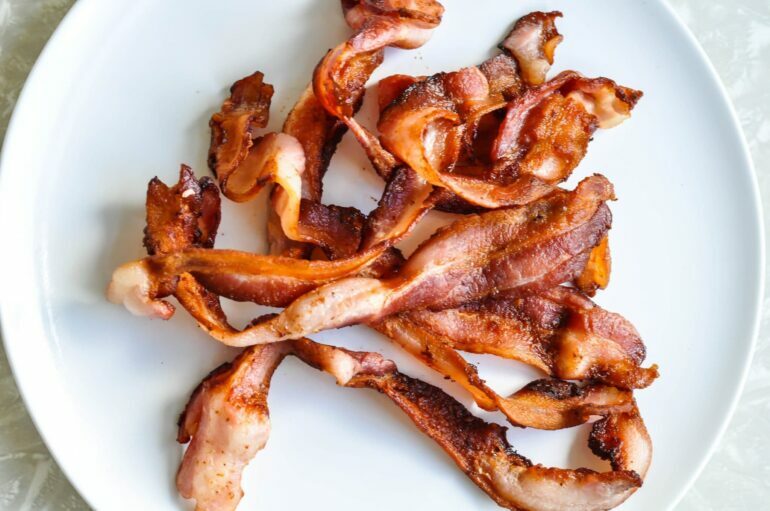 there isn’t much protein in bacon to begin with, and once you get it cooked down… pure fat!! Is this a joke? Ask your doctor before going on a bacon diet, please! This is NOT a joke. You need to do some research. High fat diets are NOT the danger that we were taught for so many years. It turns out that the high amounts of carbohydrates that the American people were duped into eating has created the obesity epidemic and contributed to the increases in Diabetes and Alzheimer’s disease. And the whole thing was based on a lie and a cheat. Dr. Ancel Keyes LIED about his study. When 22 countries proved him WRONG, he made it a seven country study by cherry picking the countries that showed he was right and it was just an observational study to begin with. NO SCIENCE involved. You need to read the books that the late Dr. Atkins wrote. He probably saved my life. My blood lipids are great! HDL 115 and TRI 32 to name a few. I’vs been LC for two decades. When you consider most of our “man made” diseases (as he called them), didn’t even exist a little over 100 years ago, why would I go back? When I have I gain weight and my lipid levels go in the,wrong direction. When I did the low carb diet I lost 10 pounds in one week, in two weeks my chol dropped 30 points. The weight literally melted away and I could hardky wait to weigh myself each day…there was always a loss. I lost 30 pounds in 4 months!! The problem is, you must get at least 800 calories a day, but you are never hungry and you have to monitor this closely. I found that I was getting less then 500! I am trying to get back to this way of eating…I have severely cut back on the carbs and will start the really low carb diet this week. I need to lose 15 pounds… If the last time is any indication, it should take about a month. Who told you that you have to eat a minimum 800 calories a day? If you don’t eat anything at all, your body supplies the calories that you need by burning your body fat. That’s what it’s there for. You can go whole days without eating and stay very healthy. 2500 calories? Where did you calculate that number from? From what I’ve seen, 2 lbs of cooked bacon would be closer to half of that (about 700 calories per pound). Losing quite a bit of weight with only 1400 calories per day is not surprising. Bear in mind some streaky (or striped) bacon can vary in fat making some brands more calorific. If this is the same guy who did the video documentary he may have been taking the Bacon fat that cooked off and drinking it as shots. That would make up for the extra calories that you don’t have in your equation based on cooked bacon losing most of the liquid fat in cooking. They don’t expect people to drink the drippings. Erik you sure think you all that don’t you? Are you a doctor? Have you done any studies? Have looked at Dr Atkins, Dr Stephen Phinney, Prof. JEffectively Volek, Dr Eric Westman from Duke University, Dr Caryn Zinn or how about Mulvane, Blanchett and Bjerregaard and did you bother to read The Inuit Paradox? So I think before you scream bloody murder check your facts! If you bothered to read the original report in Science (Science. 2015, 349, 1343-1347) which I guess the “Inuit Paradox” stems from, you would know it is a genetic trait. Unless we are from those small arctic/sub-arctic communities, we don’t have those genes and thus all the advantages in fat metabolism that come with them. Being on ketogenic diet is about being smart and choosing your fat and meat wisely. This is freaking awesome. I’m going to try a week of it. We should fire up a Subreddit for it. Bacon is high in saturated fats…bad if you want to avoid heart disease and stroke. This blog is so misleading I almost don’t know where to begin. 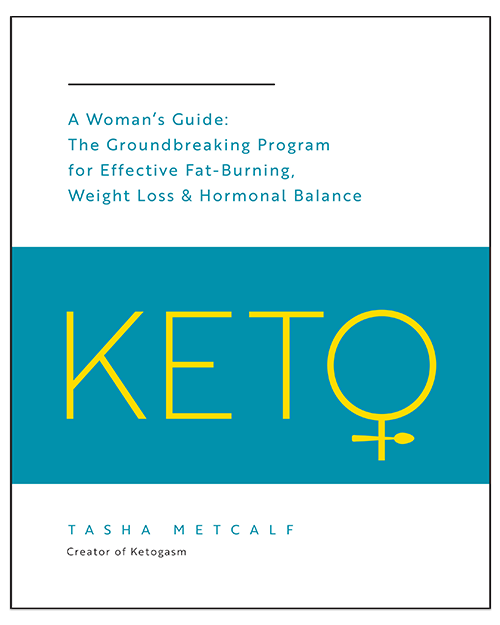 Keto endorses HEALTHY fat consumption. That means coconut oil, ghee, avocado, etc. Bacon has way too much sodium. Bad if you have elevated blood pressure. Also bad if you have osteoporosis. People are getting biased results from very young, very active people in these types of blogs. Being young and active it is indeed possible to avoid the dangers of a lot of dangerous things. Bacon is a PROCESSED MEAT. This means it is one of the #1 causes of cancer. Processed meat contains nitrates, preservatives that, when absorbed by the human body, convert into N-nitroso, the compound that could cause cancer as well as chronic pulmonary disease. Most bacon comes from FACTORY FARMED PIGS..you know..the ones full of antibiotics. David, I don’t know what keto endorses, or what healthy fats are, but coconut oil is around 82% saturated fat and bacon is around 34% saturated fat. Almost everything you’ve said is demonstrably wrong. Science has moved on a long way from the ridiculous non-science that came up with the guidance you espouse. Sodium is a risk for HBP in sodium sensitive people which is only about 20% of the population. The rest of the population generally needs more sodium and many suffer from hyponatremia. Most keto folks need added sodium since keto is a diuretic way of eating (we pee much more). Saturated fat is the MOST healthy fat – multiple RCTs and meta-analyses prove this. Poly-unsaturates are the worst (high Omega 6) (trans fats are the worst but banned in most countries) so butter, bacon grease, etc. are great for you. They are chemically stable because of being saturated, polyunsaturated ones oxidize horribly into toxic free radicals because they are chemically unstable (have empty hydrogen slots in their structures) yet these are the ones the vegetable oil producers push as healthy. Mono-unsaturates are fine like Olive oil etc. The factory farming and animal abuse… I’ll give you that. There are long-term problems with this short-term diet, especially if you have it too crispy etc. but nothing to do with the fear-mongering based on old discredited ‘science’ that you spout. when eating low carb high fat moderate protein diets you need that salt to keep your electrolytes up. It’s PROCESSED SODIUM that is dangerous for you!! David is right. So many people do research to support what they WANT to believe and don’t tend to focus on the logic in its entirety. Bacon may give you protein and portioning out 2 Lbs of food a day is fine, but it is clogging your arteries. Your ventricles and atriums are slowly coagulating with cholesterol. It is not healthy. Blood pressure is dictated by several factors. For instance: If you have thinned out blood and coagulation in your arteries it will display perfect blood pressure. As long as you aren’t short on oxidized blood that is. Cutting out carbs is such a tortue. You don’t have to be an all or nothing person to lose weight. Self-control goes a LONG way. I was 360 Lbs. I am 329 Lbs and constantly losing. I started calorie counting 23 days ago. That’s almost a pound a day. I am utilizing protein to feed on fat. It’s working. I’m not losing water weight, or muscle mass like people entertaining ketogenic diets are. I am losing 100% body fat. I have my body fat content measured every week via electrode signals and latency measurements. I could not imagine only consuming 2 Lbs of food a day. I eat lots. I even eat bread, pasta, tons of meat, veg, fruit, etc. I also have a big freezie every evening after supper. I consume 1,700 calories approximately a day vs the 3,000 needed to maintain my weight. If being on a ketogenic diet makes you happy, then so be it. I’m trying to share an easy method to control oneself without cutting stuff from your life. All in moderation. Anthony – congrats on your weight loss BUT – check out what happened to almost every member of the Biggest Loser crowd who lost the same way. They almost all put most, all or even more weight back on afterwards because they destroyed their Basal Metabolic rate by over 700 calories per day… which never came back when they stopped calorie restricting so they inevitably put the weight back on. Look up a Harvard study into this. Keto is actually incredibly healthy because it is based on the actual science of the body’s biochemistry. You can try to write it off as just bacon heads trying to justify their love of bacon, but it is very healthy, is proven in millions of everyday participants who are reversing multiple diseases (T2, CVD, HBP, RA, etc.) as well as their obesity, and lots of professional sports people who are finding vastly improved endurance and performance from a low carb, high-fat diet. If you were 360lbs you are almost certainly highly insulin resistant which will probably be the root cause of your obesity (not the other way around). Controlling your insulin production is the key focus of the keto way of eating – the broad benefits come from this. Calorie restriction will work for a while but it is truly not sustainable and the key reason why 97% of dieters cannot keep the weight off (without life long starvation & exercise). I implore you to research Keto properly and make an informed decision for your health. Keto does not need to include ANY bacon and has many healthy vegetables and is only moderate protein. The fact that many doctors have not yet come on board is because they are stuck in the same old ineffective science (calories in calories out, etc.) that is patently wrong. Many doctors ARE on board and having amazing long-term success with thousands of patients. Check out Dr Eric Westman, Dr Sarah Hallberg, and dietdoctor dot com and ketogenicforums dot com for much much more. You owe it to yourself to at least investigate. Yeah, first and foremost finding “high quality” bacon, isn’t going to prevent you from eating all the crap that those porky pigs have been storing; namely the persistent and bioaccumulative compounds that come with cheap feed and CAFO factory farms settings. Even organic isn’t great, anymore, but that would be preferable. Beyond that, only cavemen (or the dietary restrictioned) should be on non-carbohydrate diets. Hunter-gathering at least. I was thinking about doing the bacon only diet to lose the last 10 pounds. I am a female so i get 1.5lbs of bacon/day. The “cleanest” (0.5 carbs) i find has 5.2gr salt per package of 200gr which means i get 15.6gr of salt or ~6gr of sodium(RDA: 1.5gr sodium/day)!!! if i eat 3 packages-600gr total-every day! Won’t that cause high bp and water retention??? I wanna do this so bad-love bacon- but i can’t afford any weight gain atm! Pls someone… Any experience? Not unless you are salt sensitive – most are not. Keto is diuretic so will pee much more and the body is great at just peeing out any excess sodium if you don’t need it. Test it on a couple of days and see how you feel (though if you are feeling ill you probably have the temporary Keto flu which everyone gets as their body gets used to not eating carbs and the instant glucose response). Research keto for more e.g. DietDoctor dot com. Was wondering if you’d were counting your calories on the bacon fast if you did how much calories per day? What about for those of us without gall bladders? Is it hard to process all that fat? in general, do you eat more food and calories on a ketogenic diet versus a “normal” non-keto diet? Eating excess (or even small) amounts of bacon and other processed meat containing nitrate/nitrate increases the risk of cancer in humans. Period. WHO has classified such meat as group 1 carcinogens, which means: “This category is used when there is sufficient evidence of carcinogenicity in humans. In other words, there is convincing evidence that the agent causes cancer. The evaluation is usually based on epidemiological studies showing the development of cancer in exposed humans”. Commentators above that use natural nitrate/nitrite content in vegetables as an argument for the safety of eating bacon and other processed meats containing nitrate/nitrite are oversimplifying a very complex problem. It is true that the majority of consumed nitrate/nitrite comes from vegetables. However, it is the formation of nitrosating compounds and their subsequent reactions with amines which result in formation of carcinogenic N-nitroso compounds that is the problem. This process occurs during processing, storage and cooking of nitrate/nitrite containing meat. Due to various mechanism, for example presence of antioxidants, this does not happen, or occurs at a very low level, during cooking, storage and digestion of vegetables. Not to mention the presence of very high levels of sodium in processed meat which will easily overshoot the recommended daily intake. Please think before you promote potentially very harmful eating habits!